One of the most Earth-like alien planets ever discovered may not be capable of supporting life, a new study reports. 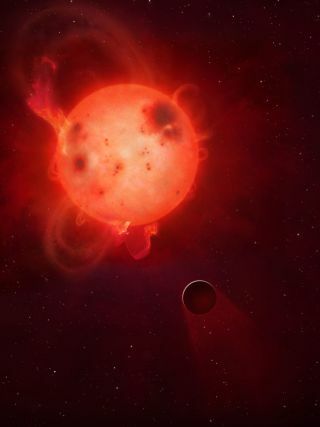 Every few hundred days, the host star of Kepler-438b — an exoplanet just 12 percent wider than Earth that appears to be the right temperature to host life as we know it — blasts out "superflares" of high-energy radiation more powerful than any eruption ever recorded from our sun, the researchers said. "With little atmosphere, the planet would also be subject to harsh UV [ultraviolet] and X-ray radiation from the superflares, along with charged particle radiation, all of which are damaging to life," Pugh added. Kepler-438b, which lies about 470 light-years from Earth, may be able to retain an atmosphere if it possesses a global magnetic field like Earth does, the researchers said. "However, if it does not, or the flares are strong enough, it could have lost its atmosphere, be irradiated by extra-dangerous radiation and be a much harsher place for life to exist," lead author David Armstrong, also of the University of Warwick, said in the same statement. As its name suggests, Kepler-438b was discovered by NASA's Kepler space telescope, which has found more than half of the 1,900 or so alien worlds known to date. Kepler-438b has a 70 percent chance of being rocky, researchers have said. Indeed, it's the most Earth-like alien world known, according to the Earth Similarity Index (ESI), a metric that takes into account an exoplanet's size, density, surface temperature and other characteristics. Kepler-438b's ESI rating is 0.88, on a scale from 0 (no similarity to Earth) to 1 (a true Earth twin). In second place is Kepler-296e, a planet about 1,700 light-years away that sports an ESI of 0.85. The new study appeared online today (Nov. 17) in the journal Monthly Notices of the Royal Astronomical Society.